Recently, Nadya Visage formal dresses 2014 have been launched. All the women out there get ready for shopping and fasten your car seat belts because Nadya Visage formal dresses 2014 for women collection has all arrived in the fashion planet. Talking about Nadya Visage, this fashion label has been known as being one of the most top popular and leading ones. She is one of those fashion houses that have earned the fame and success limits in their career in just few years. Nadya Visage has been offering with just women collections that are simply based upon the seasonal and occasional happenings. If we talk about the main clothing lines of Nadya Visage then it has been all found with the casual wear, party wear, formal wear and semi formal wear as well. Inside this fresh collection of formal dresses 2014 the brand has been placing some of the trendy looking and stylish dresses designs. A line shirts and frocks are installed in this collection that has been set with the tights, trousers and churidar pajamas. For the readers we would like to mention that this formal wear collection has been set for the party wear and wedding functions therefore all the dresses are beautified with heavy embellishments. Embroidery has been done on the front and back sides with the company of thread work and motifs as well. All the formal dresses are outclass as the designing and stitching is simply remarkable and praiseworthy. The brand house had made the vivid and dark color combinations in their dresses that are full of life appearing for the eyes. 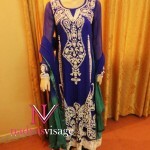 For the readers here we are pasting some pictures of lovely formal dresses by Nadya Visage. So all the women out there just catch this collection right now and we are sure that your heart beat will simply going to stop up on all the dresses designs.